Board orientation and onboarding are good first steps toward educating board members about their roles and responsibilities. The Academy’s President-Elect and Executive Director conduct a board orientation prior to each board member’s first meeting. The orientation focuses on the board’s primary responsibilities, the roles and responsibilities of individual board members, the strategic plan, the governance structure, key policies, legal and financial responsibilities, and the board/staff partnership. Onboarding at AAHPM consists of allowing newly elected board members to audit the in-person meeting at our annual conference just prior to their term of service. Each board member is assigned a board mentor to assist in the transition process. Board mentors connect with incoming board members prior to the first board meeting and share their experiences as a board member and expectations of the role. This year, the AAHPM governance team decided to add a new tool to the board orientation mix. The team created a board handbook to synthesize all the legal, fiduciary, programmatic, and operational information necessary for board members to do their job into one handy, easy-to-read publication. 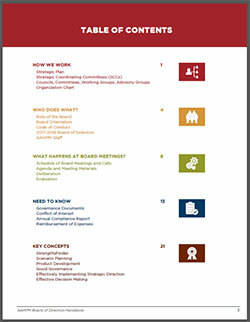 The handbook is divided into five key areas, is color-coded and features snappy graphics, to help identify how the board works, what happens at board meeting, and how to engage in board discussion. We encourage members to bring the handbook to each board meeting to use as an at-a-glance reference guide. As board members know, the strategic plan is the framework which guides everything they do. It’s not surprising then that we feature this upfront in the handbook. The strategic plan is followed by the governance structure illustrating the hierarchy for how the Academy’s five strategic plan goals and objectives are linked directly to the five strategic coordinating committees (SCC) and their aligned subordinate committees. This section explains how recommendations initiated at the committee level are vetted via the affiliated SCC and upon approval, work their way to the board for consideration. An organizational chart listing all 30+ committees, councils, advisory groups and their chairs, and staff liaisons is also featured. Board members need to know their specific roles and responsibilities, including legal responsibilities (duty of care, duty of loyalty and duty of obedience) that accompany board service. So there is no confusion, the role of the President, the Board, the Executive Director and staff is outlined in clear concise bulleted format. Board members are committed to observing and promoting the highest ethical conduct which is contained in the Code of Conduct, featured in this section. The AAHPM board strives to be a strong, high functioning board, so we display the Core Characteristics of a Strong Board as a reminder of this goal. Recognizing that all board members may not know one another or staff, we decided to put a face with a name by adding photos of board members and staff, strengthening the connection. This means there are no more excuses for missing a board call because of not knowing about the dates and times. The complete schedule of calls is outlined in this section as well as the exact time and location for in-person meetings. The format of board agendas including intentional placement of generative, strategic and fiduciary topics are spelled out in this section. Wonder what the consent agenda is? Not any longer. How to access the “board only” page of the website for meeting material is explained in this section, too. New and seasoned members of the board can always use a step-by-step lesson on how to make a motion by referencing the Robert’s Rules of Order motion template. This section helps direct members to governance documents such as articles of incorporation, bylaws, policy and procedures as well as the Conflict of Interest policy which can be found on the “board only” page of the website. The Academy expense reimbursement policy for board members is also detailed in this section. Lessons learned and key visual models used during past generative sessions are displayed in this section. It is our hope that these visuals will help members recall these useful concepts as they are referenced throughout their board service. The governance team received an overwhelmingly positive response after debuting the handbook at our board meeting in February. The team plans to incorporate board member feedback into the next version as well as monitor its use and evaluate its effectiveness moving forward. We hope this new tool helps educate our board members and make board service less daunting.